Bassnectar | NYE ATL: HERE WE GO! NYE ATL: HERE WE GO! NYE has always been a time to reset yourself and look ahead with a fresh outlook. It’s a time to reflect on who you have become and where you have arrived. It’s a time to set goals for where you want to go and which path you want to take to reach your potential. To get you thinking, answer the two following questions for a chance to win some last minute tickets to NYE this Sunday in ATL: 1) What were you most grateful for in 2017? and 2) What do you hope to achieve in the new year? It’s no mystery, NYE is a celebration – and rightfully so! We have much to celebrate and be thankful for. But with celebration comes the party, and while we love a good party, we also want to see those around us being healthy and safe. We ask that you look after your fellow Bass Heads this weekend. That goes for complete strangers too: if you see someone looking like they need a buddy, introduce yourself, lend a hand, and let them know your there for them. It goes a long way. If you plan on drinking alcohol this weekend, be mindful of your body and your limitations. 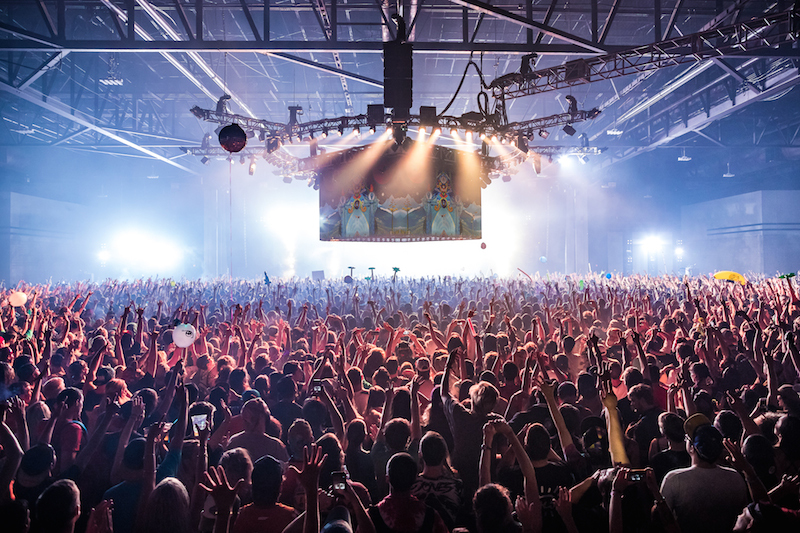 We encourage you to water up and hydrate, because there’s going to be tens of thousands of freaks packed into a room that’s sure to heat up, so be sure to keep your muscles happy and your energy high. Water is Life!!! If you need water, look for an Ambassador or take a visit to The Haven – we’ve sorted this event with LOADS of water, and it’s for you! One area our team has been really digging into of late is the idea of safe spaces. Our goal is for our events themselves to be safe spaces – temporary portals to another world of open-minded individuals. We are a close-knit community full of friends and family, familiar strangers and unique beings, and we hope that everyone in attendance feels they can freely express themselves at Bassnectar events without fear of judgement or intolerance. We also have been constantly developing and reimagining safe spaces and zones within the events themselves. 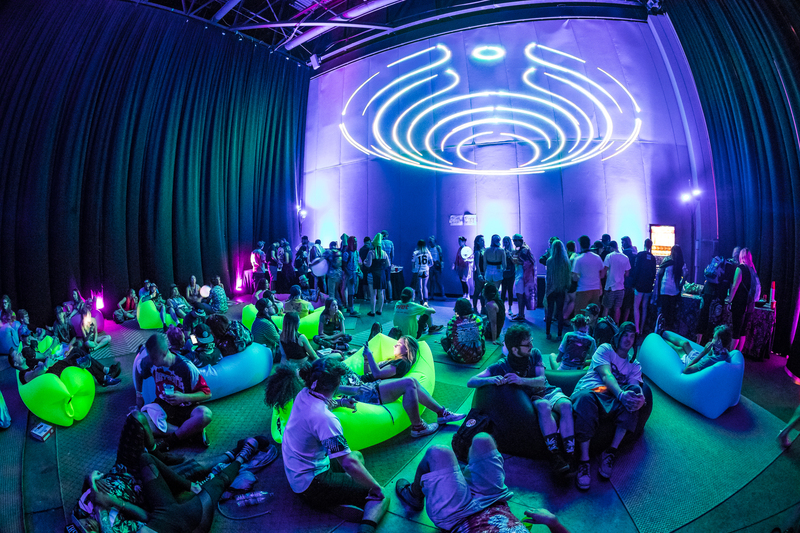 The Haven has been a central feature at our events for two years now – a retreat from the madness and intensity of the Bassnectar experience. You go to The Haven to relax, recharge, and refresh yourself before jumping headfirst back into the action. We have plans to continue to create more safe spaces alongside/inside The Haven, where anyone needing any extra support or advice can easily connect with others and feel comfortable doing so. In order to maintain these safe spaces, it’s critical that we work together to make sure everything is kept secure and positive. If you see someone being mistreated, say something! If you feel as though you need support or an ally, please find an Ambassador or make your way to The Haven. Our priority is making sure everyone feels welcomed! Once again we’ve assembled a massive team of Ambassadors to look after the community throughout the event. If you see an Ambassador, say hello and thank them for the amount of time and energy they dedicate to making sure everyone is cared for – thank you Ambassadors!!! You will also find Ambassadors inside The Haven – this sacntuary space is the hub of Ambassador activity. The Ambassadors will be there to greet you and answer any questions you may have. There will be light refreshments available, seating to get off your feet, massage therapists, ways to connect with others and make new friends, plus so much more. The Bass Network will be hosting a Clothing Drive the night of the event at the entrance of the venue! The donations will be given to Hands Across Atlanta who will distribute the clothing to those in need throughout the city. Let’s make a difference to this place we know and love – RSVP + invite your friends to join here. 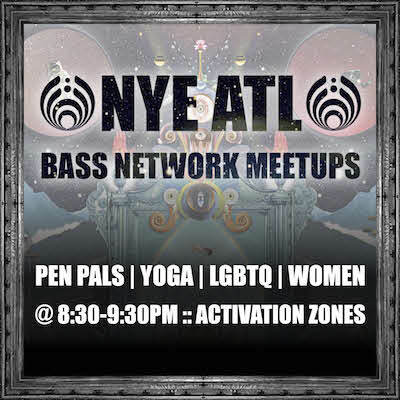 And as usual the Bass Network will be hosting a series of meetups throughout the night to connect Bass Heads from across the country with one another under one roof. All of these take place in the Activation Zones! You can RSVP + invite your friends to join here. As Trump and Fox ‘News’ lie and cheat and create noise and fake news, truth is ever more precious. We resist the attacks on freedom, our environment, and our civil rights. This is OUR world, not theirs, and there is real work we can do right now to make a better world possible. As the words Climate Change are erased from the EPA website, and taxes rise on teachers who buy school supplies out of their own pockets, this event will focus and fundraise to help youth live sustainably, and fight back against the dark, fake future their parents and grandparents might have voted for. This is a long game. Big changes happen over generations, with the seeds these fantastic community groups are planting now. > Visit the Earth Guardians booth to sign the Climate Leader pledge for 2018, make resolutions to reduce your climate impact, or purchase Xiuhtexcatl’s book, We Rise! > Thank your bartender at Georgia World Center for going straw-free! No straws will be served during our event! Drinking straw production contributes to petroleum consumption and is filling our oceans with plastic. Because straws are not biodegradable, they become part of global plastic pollution when thrown out – typically after only one use. 500 million straws are used daily in the United States, many of which end up in the oceans (and in the stomachs of aquatic creatures, who mistake them for food). Earth Guardians Youth Director Xiuhtezcatl Tonatiuh is one of 21 youth plaintiffs suing the federal government for the right to clean air, clean water, and a healthy future. These young leaders have created a wave of action as their case advances through the courts, and we ask you to reach out to them, get to know them, and join the cause. > Donate for a 2018 Ticket! The first 50 fans to become a ROLL MODEL for $100 at the WeCycle booth on New Years Eve get a free floor ticket to a Bassnectar event in 2018 (non-festival). Bassnectar will match each donation up to 50. Together, we can sponsor 100 local kids for an entire year of participation in Youth On W.H.E.E.L.S. (Work Ethic, Health, Environment, Economics, Leadership and Sustainability), including a bike, bike lessons, guidance, and meals. > Ride your bike, get a Bass Bike Patch! 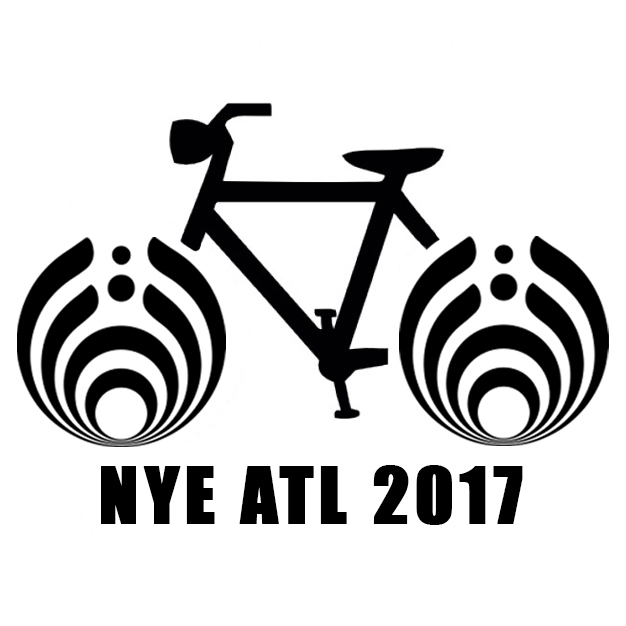 The first 250 folks who ride their bike to the New Years Eve show can get a free bass bike patch gift, screenprinted by local artist Gabeaux! To get your patch, take a picture of yourself with your bike in front of the entrance when you arrive, then show it to the WeCycle folks inside. Or, donate $10 at the booth to get a bass bike patch! If you meet WeCycle and are inspired to do an internship with them in Atlanta, Bass Network wants to follow your story and share it. Please visit their booth for more internship information, and reach out to Bass Network once you start interning! The Teardown Community will be showcasing local projects for social change. Learn how activists are feeding the hungry, standing up against injustice, and responding to the end of Net Neutrality. Together we can challenge the powerful and change the world for the better, find out how you can get directly involved! > Have a real conversation about 2018 activism! The Teardown have many different initiatives and resources. They are coming to the show to talk to you about how you want to take action on a personal level. Get inspired with a real conversation about your passions, and your abilities, then get connected to ways you can directly work to transform society for the better. This is just a taste of what’s to come! We’ve put a lot of time and love into this, and hope that you come early, come ready, and come with an open heart and mind.